The police are advising the public that there will be traffic restrictions in Hamilton due to the Convening of Parliament ceremony on Friday, September 8th. 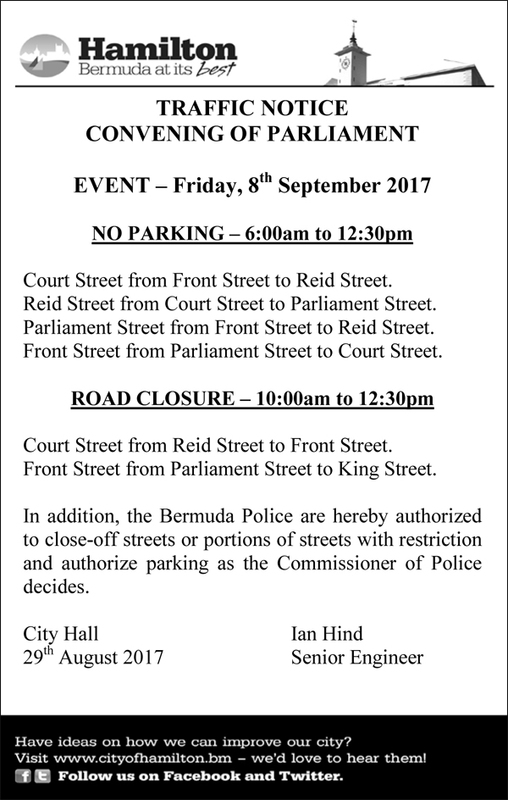 The Bermuda Police Service would like to remind the motoring public that the Corporation of Hamilton has issued a traffic notice authorizing sections of roads to be closed temporarily and traffic diversions in the City of Hamilton for the Convening of Parliament ceremony from 10am Friday, September 8th until the event has concluded. Front Street – between Parliament Street and King Street. Exit to No. 6 car park. Court Street – between Reid Street and Front Street [access will only be allowed for container vehicles entering/exiting the Hamilton Docks]. Front Street / King Street. Front Street / Parliament Street. Court Street / Reid Street. Motorists traveling along East Broadway [Crow Lane] into the City of Hamilton are advised to use Spurling Hill, before reaching the traffic diversion at the junction of Front Street and King Street.